eLYQD is a decentralized ethereum based ecosystem marketplace that will be the framework for the entire vaping industry. One of the main features of eLYQD is the use of blockchain technology, which allows making the platform transparent, open and as safe as possible for both transaction parties, reduction of transaction and business costs, and simplifying of the purchase process. Furthermore, eLYQD is a platform designed to allow vaping industry manufacturers to create an online store that will make good use of the most advanced technologies in the e-commerce field, and providing the vaping community the freedom of choice and the option to pay for products with LYQD tokens, fiat or cryptocurrencies. The eLYQD marketplace will increase the efficacy of all business interactions by freeing them from all kinds of middlemen and making those interactions immediate, transparent, secure and mutually beneficial. This vision will be achieved by creating a fast blockchain-based decentralized ecosystem and organizing user interactions on the peer-to-peer basis. The goal is to connect e-liquid producers all over the world and supply the tools needed to launch a single sane platform to the global market without businesses, minimum transaction fees and financial limits, agents or annoying bureaucratic routines. They will bring together manufacturers to create their own economic Crypto trading that will bring e-commerce to a new level. Consumers have access to brands from all over the world 24 hours a day, 365 days a year, wherever they are. LYQD tokens allow users to send and receive payment globally in minutes, eliminating the risk of nonpayment and costing a tiny fraction of the total eLYQD blockchain will facilitate immediate fund transfer into escrow accounts. All constituents can manage escrow accounts through smart contracts. The eLYQD recordkeeping app will allow for simplified electronic record creation and store this data on a decentralized anonymized network that is significantly harder to hack and leak. The eLYQD system will eliminate points of potential breakdown. eLYQD smart contracts will (a) ensure that transitions occur smoothly and (b) keep immutable records of actions taken by all constituents. 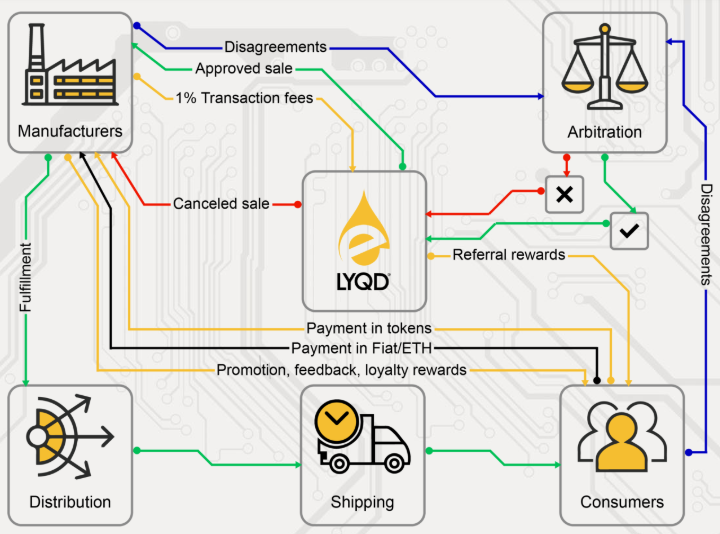 eLYQD requires proof-of-order, time/location stamping of the actual transaction, and undisputed hash records of all steps executed, from order, billing to shipping. The eLYQD network will record all transactions, positive actions improve a user’s reputation. The risk of a negative review motivates all parties to remain honest. 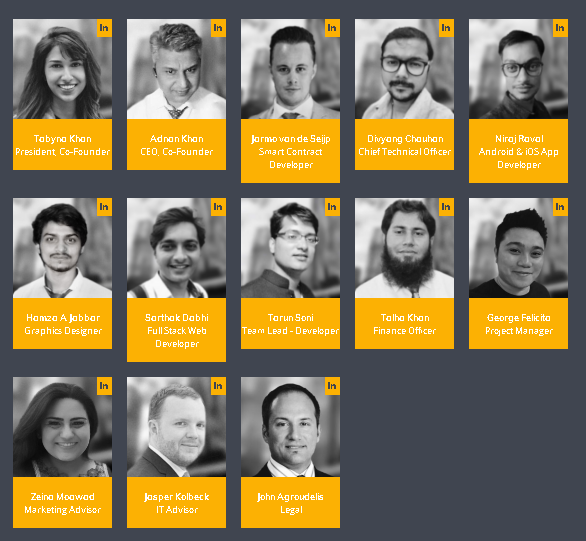 eLYQD's blockchain-based decentralized network will provide a platform for the next generation of peer-to-peer (P2P) apps to support and record all constituent interactions in the value chain, with proof of completion and compliance at each step. The eLYQD ecosystem will be used by mass consumers and product manufacturers, from all around the world. eLYQD is a platform for buyers and sellers from all over the world. With an easy-to-use online platform, any manufacturer can make use of the broad features of the platform by creating their own stores to sell their products for a minimum fee. Their service offers free-running users, small-scale manufacturers, multinational companies, direct customer feedback, accounting, sales analysis, advertising and publicity, as well as excellent opportunities to have a user-friendly interface. eLYQD's income model is fundamentally different from traditional e-commerce platforms. Traditional e-commerce platforms usually charge a fixed fee along with a commission fee sometimes over the selling price. Buyers may also have to pay for PayPal or other payment processing solutions. "The fundamental unit of value within the eLYQD marketplace is the LYQD Coin token (“token”), backed by the vaping industry. Tokens provide non- volatile, inflationary - resistant digital value within the eLYQD marketplace. The LYQD token will be derived from a standard Ethereum ERC 20 token and will be tradeable on exchanges. The eLYQD platform offers the vaping industry a sharing -economy marketplace without country borders, intermediaries, or central hubs. Here, transactions between manufacturers and consumers are routed through a decentralized peer- to-peer network. The distribution will be carried out through a smart contract. 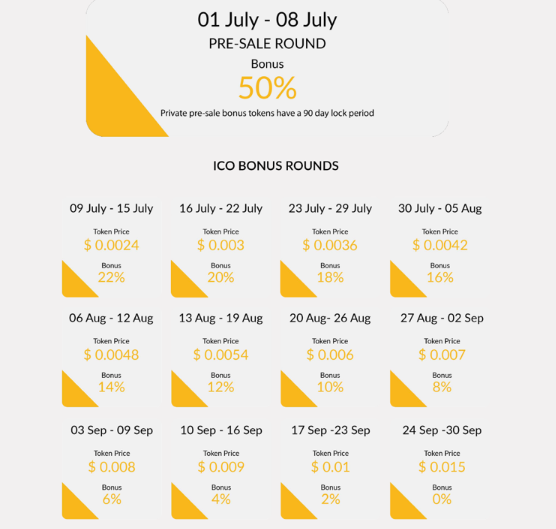 Raised funds will be used to launch the platform,integrate the token and finance promotion and marketing. Depending on the raised sum, they will execute the project on different levels. Integrated within the Ethereum smart contract, it will serve as the utility token of a decentralized autonomous organization – known as elyqd world platform. LYQD token will act as the underlying fuel driving all components to perform effortlessly while maximizing the benefits by providing the lowest pricing in the industry."